Currently, the Golden State Warriors are -175 to win the 2019 NBA Championship. If I offered you the Warriors or the field at even odds to win the title, who would you take and why? Hutchinson: I’d take the field, primarily due to the Boston Celtics. Ainge’s squad is extremely deep with wings that can match up against the Warriors. They’ll be able to play Golden State’s game and their own style. My faith in the Celtics this coming season makes the field the choice for me. Johnson: There wasn’t a team in free agency that made enough upgrades to compete with the Golden State Warriors, and that was before they maneuvered their way into signing DeMarcus Cousins. 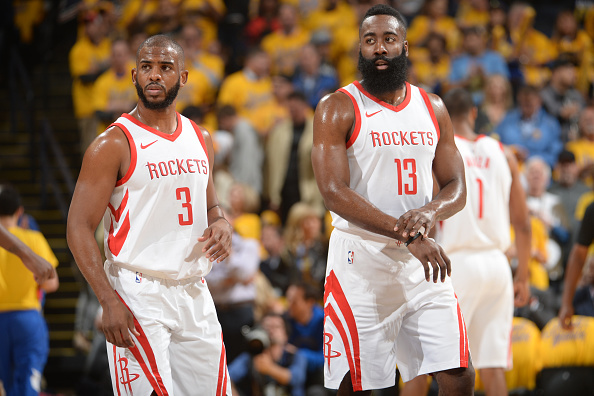 The Warriors toughest challenger from last year, the Houston Rockets, arguably will be worse this upcoming season compared to last year after losing Trevor Ariza and Luc Mbah A Moute in free agency. Their biggest threat this year will likely be the Boston Celtics, reinforced with a healthy Kyrie Irving and Gordon Hayward. 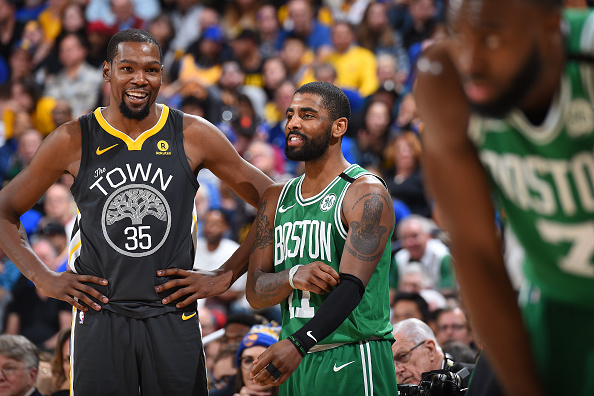 Even so, they don’t have the talent Golden State has, and they may still lose Marcus Smart in free agency, who was a crucial cog on their roster last season. The Warriors will reign supreme once again. Liffmann: At this point, it would be hard to bet against the Warriors winning their fourth title in five years. Keep in mind we do not know yet where the big domino of Kawhi will end up, which could change the landscape of the NBA. But in the meantime, I would say a healthy Boston Celtics team would be the toughest competition for the Warriors. The Rockets got a little worse with the loss of Mbah a Moute and Ariza. The Thunder remain a tough team when healthy but still have too many holes. The Lakers added LeBron, but are far away from contention. The Sixers could be more formidable next season but still probably wouldn’t beat Boston in a seven-game series. The Warriors could have run it back with the exact same team as last year and I still would have put my money on them, but instead they added Cousins and are reworking their inconsistent bench. As of now there is no reason to bet against them. Lloyd: I feel pretty confident in taking the Warriors. They are the reigning back-to-back champions and dealt with a Steph Curry injury and a high-powered Rockets team last season, and still came through. Who knows how Cousins will look when he returns from his Achilles injury, but even a 75 percent Boogie, paired with the Rockets getting worse this offseason (and still not having Clint Capela under contract), and only two major injuries to their four existing All-NBA players would make me reconsider my position. Smith: I’ll take the field. The Dubs were a Chris Paul injury away from oblivion in the Western Conference Finals this season just past and there’s so many variables that can come into play. A raft of injuries, lack of depth, finding the motivation to climb the mountain again … and, uh, gulp, the Boogie Cousins factor. For the field, there’s more than just the Rockets who, regardless of what the odds say, will fancy their chances against the reigning champs. There’s just too many different factors to expect the Warriors to enjoy another run of good fortune. The Chicago Bulls are making moves—retaining Zach LaVine on a high price tag and signing restricted free agent Jabari Parker. The fans are optimistic; the blogging community less so. Are the Bulls a playoff team next year? Johnson: Even with a pretty depleted Eastern Conference, the Bulls do not have enough talent to make the playoffs. LaVine and Parker are good players in theory, but their injury history does not give much hope into them being healthy for the full season, a must for them to be even in the talks of making the playoffs. Kris Dunn is an okay point guard, but at best he ranks out as an average starting point guard throughout the League. Wendell Carter Jr showed exciting flashes throughout Summer League, but he’ll need time to develop against tougher NBA competition. Lauri Markkanen has the potential to be a very good player in the NBA, but like Carter, it’ll take time for Markkanen to reach his potential. Besides, Chicago isn’t loaded with depth either. A miracle would have to take place for the Bulls to make the playoffs. Liffmann: The Bulls are attempting to be relevant again, but the only reason they have an outside chance at a playoff spot is simply because the East is so weak. I’m not a fan of the deal for LaVine, not because of the $20M per year tag as much as the four-year commitment at that rate. Parker is a low risk move considering the deal pretty much equates to a one-year deal, so perhaps they can hit lightning in a bottle and convince the once promising star to stay with them if he were to explode. Parker to me is a glorified Michael Beasley as of now, a highly efficient scorer who isn’t great at sharing the ball and is a major liability on defense, and yet Beasley will probably make $18m less than Parker next season. I am a fan of Robin Lopez and what he brings to the team, and if Markkanen were to keep improving, there are good young offensive pieces that could push this team towards an eight seed. Lloyd: The Bulls are not even close to a playoff team next season. Yes, the Cavaliers are going to drop out from the East’s 2018 playoff group, but the Hornets and Pistons are both better positioned to take that spot than the Bulls. For all the talk of the Bulls getting better, I think there is a realistic chance that their best player by season’s end is a rookie—Carter Jr. LaVine and Parker are no-defense, overpriced chuckers; Dunn offers nothing on offense; Markkanen has defensive issues and could have shots siphoned to Parker and LaVine; Chicago also has one of the most egregious chuckers in the NBA, Justin Holiday. 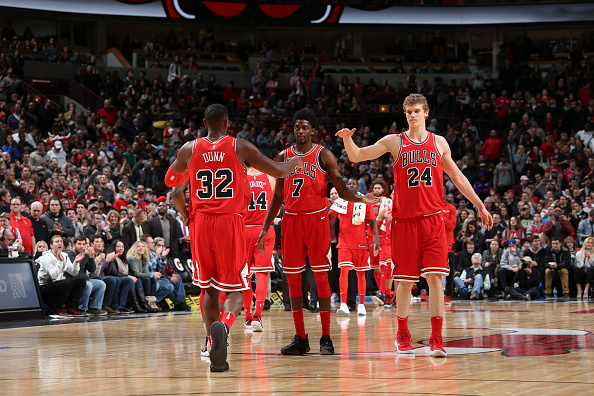 The Bulls are more likely to finish under 30 wins than make the playoffs. Smith: No. Why not? Because the much-maligned Bulls front office continues to alternate between good and puzzling decisions. After massively misfiring with the Butler/Wade/Rondo triumvirate two years ago, Chicago has drafted shrewdly, nabbing Markkanen last year and Carter Jr. (who has looked VERY promising in Summer League. Yes, it’s Summer League, but still). On the flip side, they’ve taken a massive leap of faith by matching Sacramento’s offer sheet for Zach LaVine, and then signing 2014 No. 2 draft pick Parker from Milwaukee. It’s a high-risk, medium-reward proposition. 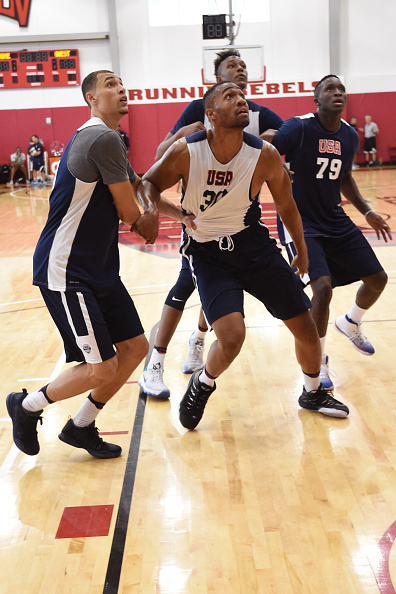 Not to mention, Parker plays best at a frontcourt position the Bulls already look pretty set at. Forcing him to the 3 spot seems like a square peg-round hole situation. If absolutely everything goes right, Chicago could maybe sneak into the rotation of bad teams vying for the final playoff spot—but how often does everything go right? Hutchinson: No, and they shouldn’t try to be. Now is the time to develop their young talent, go after one more lottery pick and chase the summer of 2019’s free agent class. The Bulls have talent, undoubtedly. This year will prove whether the young talent they’ve acquired will fit in Hoiberg’s offensive scheme. If Parker and LaVine can live up to their potential they might have something legitimate. 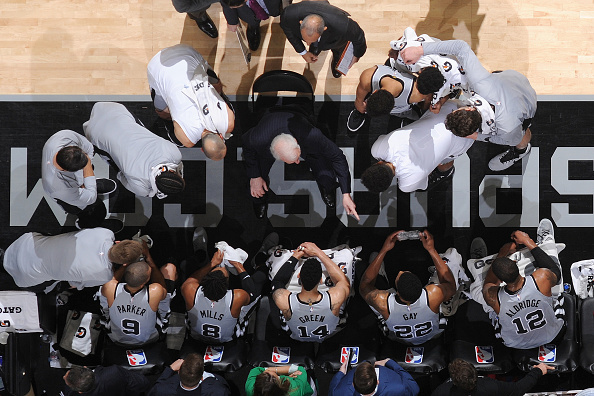 At this moment, they’re a 30-win team. Give or take a few and are better served by one more year acquiring a high pick. The back end of the Eastern Conference is looking rather putrid. Looking beyond the obvious of Boston, Philadelphia, Toronto, Milwaukee, and Indiana, who do you think sneaks into the back three playoff spots? 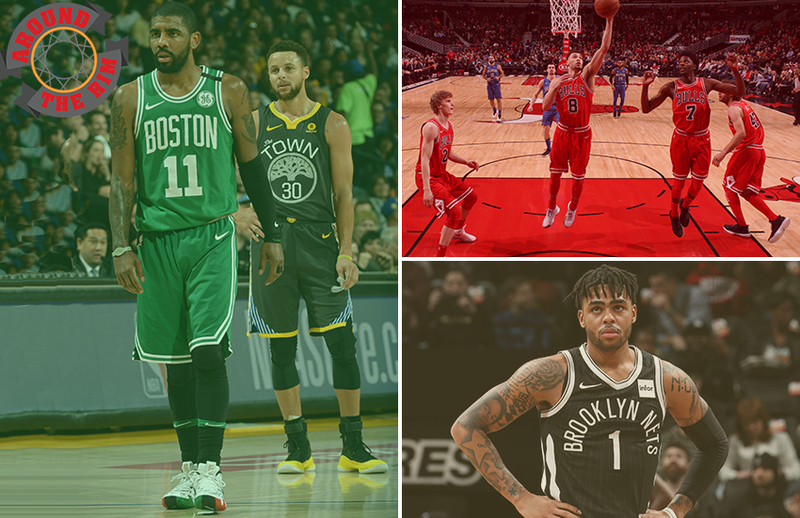 Liffmann: The East has a potential juggernaut in Boston, a future contender in Philly, a perennial winner (and flopper) in Toronto, and some good young exciting rosters in Milwaukee and Indiana. After that, it’s not very pretty. The Wizards have been disappointing the last few seasons but they still have the talent to be relevant in the East with Wall, Beal, Porter so I also expect them to be in the playoffs again next season. I think Detroit under Casey has enough talent on their roster to secure a playoff spot in the East with Drummond, Griffin, Jackson and some nice rotational players. Lastly, I’m going to go out on the limb and say the Nets and Bulls battle for that eight spot. Both teams are young and have the ability to score in bunches. The addition of Kenneth Faried, Ed Davis, Shabazz Napier and a full season with a healthy D’Angelo Russell, DeMarre Carroll, Allen Crabbe and Spencer Dinwiddie could put the Nets in the playoffs. Lloyd: Miami and Washington bring back basically the same team as last season, except the Heat will have a hopefully healthy Dion Waiters and the Wizards upgraded Marcin Gortat to Dwight Howard. So, they are locks to me. As I mentioned above, I think the Hornets—with a leap from Malik Monk and Nicolas Batum actually playing his proper position—could push, while Detroit with a full year of Griffin, a potentially healthy Jackson and a second-year leap from Luke Kennard should be right in the mix as well. The Nets should also be better, but I’m not sure they challenge for the playoffs. I know they are better than the Bulls though. Smith: Miami. *deep breath* Detroit. *even deeper breath* Washington. Both the Wizards and Detroit have enough experience to be bottom-end playoff contenders. Will that experience be enough to overcome, especially in Washington—ahem, welcome to the Dwight House—the obvious chemistry issues that have surfaced in recent seasons? Fortunately for all three teams, the insipid nature of the East Conference means they’ll all have an opportunity. The lower half of the East Conference make for a great argument in favor of seeding teams 1-16 regardless of conference affiliation. It won’t ever happen, but it should. Hutchinson: Washington is a playoff lock. Sneakily, the Atlanta Hawks might find themselves into that eighth spot. They have the offensive firepower. Throw in the Miami Heat who are always a playoff contender. Finally, if the Knicks take some steps forward under new head coach David Fizdale, I think they could get in. 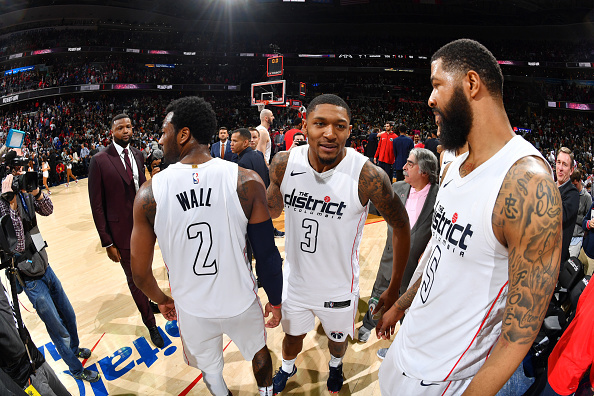 Johnson: The Detroit Pistons and Washington Wizards seem to be locks to join the aforementioned teams in the Eastern Conference playoff picture. 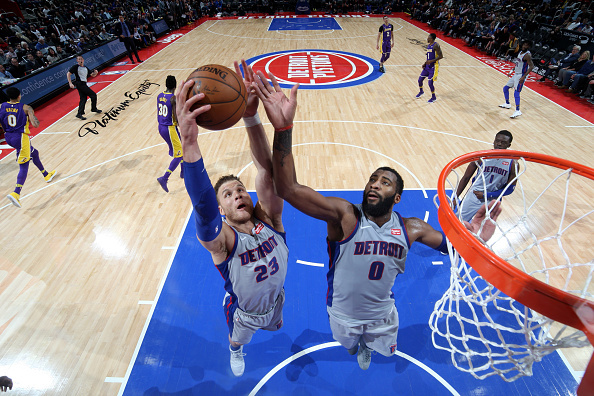 With the addition of Dwane Casey, a full season of Blake Griffin and better health, Detroit has too much talent between the coaching staff and the roster to miss out on the playoffs for the third season in a row. Washington should be better this upcoming season as well, with a healthy Wall and the additions of Austin Rivers and Howard. I’m skeptical of their ceiling, but like Detroit, there is too much talent on the roster to miss the playoffs. A team that, without having the talent of other teams, but always finds their way into the playoffs is the Miami Heat. Erik Spoelstra is an elite coach and he inspires his players, besides Hassan Whiteside, to play hard-nosed basketball. I’m not sure how the order of the conference will look, because I think a few teams could regress while others move forward, but those are the top eight teams in the East. Out West, it’s the opposite. Every team in the lottery last year thinks they improved. The Grizzlies, Mavericks, Lakers, Nuggets and Suns are all dreaming of the playoffs. Does anyone new sneak in and if they do, who falls out? 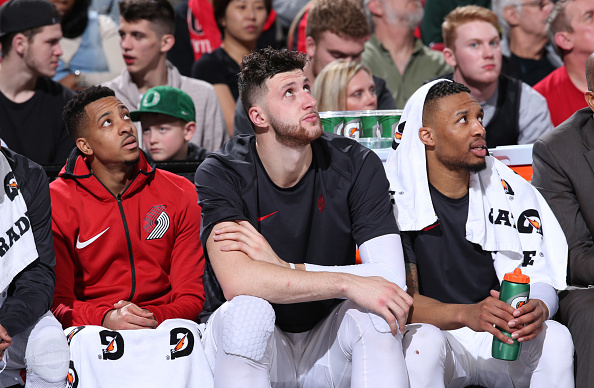 Lloyd: I think the Blazers are the big risk in the West, but it wouldn’t be a shock if Minnesota or New Orleans falls out either. I think the Lakers and Nuggets get in, while if Kawhi Leonard moves East, the Spurs will likely join the Wolves on the outside looking in. I think the Suns and Mavericks having playoff hopes are massive shots in the dark, but who knows what adding Luka Doncic and DeAndre Jordan could do to a Dallas team that also seems to play above itself. Smith: With Le Roi in LA, the Lakers are the obvious choice to jump back to the playoffs for the first time since 2013. 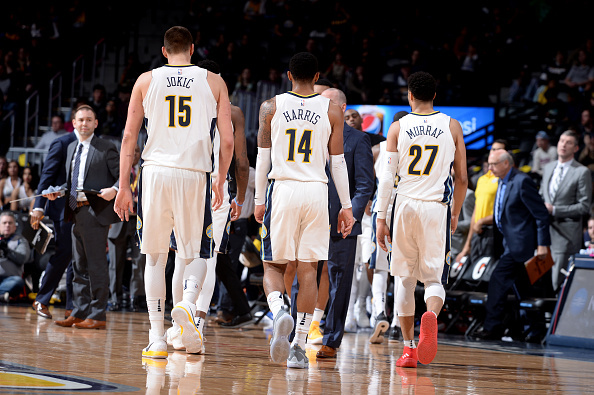 But the Nuggets, who were just one overtime period from a playoff berth this season, also loom large in the postseason picture. The Denver core has stayed intact and the addition of Isaiah Thomas should give them some added scoring punch off the bench. Meanwhile, the Pelicans, Timberwolves, and Blazers could all slip but fortunately for them, the Mavericks, Grizzlies, and Suns aren’t fully ready to make the step up just yet. Dallas, with teen sensation Luka Doncic on board, figure to be exciting, ditto the Suns with a re-signed Devin Booker, and #1 pick DeAndre Ayton. But neither squad has the requisite depth of talent to push more experienced, deeper teams out. Yet. Hutchinson: The Blazers and Pelicans are on the edge of not being in the playoffs. The Spurs, without Kawhi, should have difficulty grabbing a spot in the top six as well. The Nuggets are going to shoot up, could see them soaring as high as the fifth seed. The rest of the Western Conference have been significantly improved but expectations need to stay measured. The Mavericks, even if Luka Doncic is ridiculous, might not even crack 40 wins. Johnson: The Western Conference is loaded with talent and only improved in the offseason. The Los Angeles Lakers added some dude named LeBron and there isn’t a chance he won’t be playing in the postseason, no matter how odd the roster configuration around him seems to be. The Denver Nuggets, with what they hope will be a healthy Paul Milsap and the addition of Isaiah Thomas, should make the playoffs as well. I think the two teams most likely to fall out of the playoffs would be the San Antonio Spurs and Minnesota Timberwolves, coincidentally the seventh and eighth seeds. At this point, it seems highly unlikely Kawhi Leonard ever dons a Spurs jersey again, and at this stage, the talent in the West may outdo Gregg Popovich’s coaching wizardry. Liffmann: The Lakers and Nuggets are not missing the playoffs this year in the West, but it is hard to predict who will fall out to make that so. Crazy as it sounds, this might be the first year we don’t see the Spurs in the playoffs, though it is hard to ever bet against a Pop team overcoming the odds. Some of the final spots in the West will come down to which teams remain the healthiest. The Pelicans do not have much room for error with their lack of depth, so if they were to lose any key member of their team for a significant amount of time, they could be on the outside looking in. The Wolves are having some trouble internally as there are murmurs of an unhappy Jimmy Butler, so it is very possible some locker room turmoil could lead to issues or even trades. Other than those three teams, I do not see a situation in which the Warriors, Rockets, Thunder, Blazers and Jazz do not reach the playoffs. We’re a long way out but I’m giving you a chance to look clairvoyant six months from now. Who is this year’s Victor Oladipo? Who is the guy people have given up on or overlooked that just blows up this season? Smith: There’s a couple of guys that immediately leap to mind. Taurean Prince enjoyed a huge post-All-Star Game bump, jumping from 12.2 points per game to 19. On a largely forgettable Atlanta squad, Prince has an opportunity to build on that further this year. Much like Prince, Rondae Hollis-Jefferson toiled away on a mediocre squad in the basement of the Eastern Conference. And much like Prince, RHJ improved considerably, shooting a career-best 47.2 percent from the field and upping his scoring average by more than five points per game. 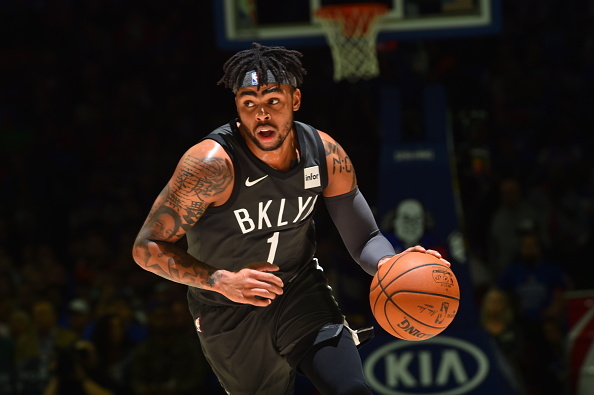 If the former Arizona Wildcat can develop even a semi-reliable three-point jumper—a big ask, given he shot an anemic 24.1 from deep on just 54 attempts this season—then Brooklyn has the makings of an extremely versatile forward. Hutchinson: I chewed on this for some time. I’m going to go with Jamal Murray. I think that he has a next level offensively, and will finally have his official breakout season along with Denver’s elite offense. Johnson: It’s D’Angelo Russell’s time in Brooklyn. Last season we saw a glimpse of the potential Russell had before he suffered an injury that made him miss significant time and lose the rhythm he had found. I don’t know if anyone can do what Oladipo did last season, but Russell should be able to compete for a spot on the All-Star team. He should spend more time off the ball, as the team looks committed to starting Spencer Dinwiddie as well after signing Shabazz Napier to back up the point guard spot. That will alleviate some pressure from Russell, and give him some opportunities to be a spot-up shooter, an area of his game that should thrive. I wouldn’t bet the house on it, but Russell could be in store for a big season. Liffmann: I think an obvious answer for this question would be Isaiah Thomas. The epic fall from grace for IT has been just short of a tragedy, going from a potential maximum contract to a minimum contract within a year. Denver is the perfect situation for IT to regain his value. He should be the leader of the second unit and can have the freedom to attack. It would not shock me by the end of the season if IT is considered for the Sixth Man of the Year award. While no one has necessarily given up on him, Kevin Love might be a guy that reminds everyone how good he can be, at least offensively. He is the clear-cut best player on the Cavaliers now, and has a chance to get back to his old self and average 24-plus points per game. If the Spurs make a run to get back into the playoffs yet again, Rudy Gay would probably play a large role in that. Perhaps we see Gay get back to his days of dropping 18-plus points per game. 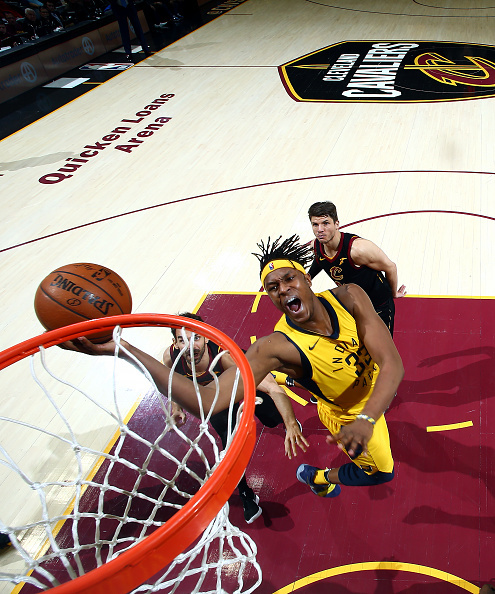 Finally, I could see Myles Turner taking that leap this season and becoming the star that many expect him to become at some point. Averages of 17 points per game, 8 rebounds and 2 blocks should not be out of the question for Turner this season. Lloyd: I want to say it’s Mario Hezonja, who has a chance at a big role in New York at either the 3 or 4 with Kristaps Porzingis sidelined, but it seems unlikely. Heading into his fourth season, I can see Turner or Russell having a big year after being underwhelming and injured last season. Turner suffered an early concussion and never seemed to get back to his form his showed on opening night. He struggled in the playoffs and down the stretch of the season and has Domantas Sabonis to battle along with newcomer Kyle O’Quinn. As for Russell, a knee injury killed his first season in Brooklyn, but Jeremy Lin is now in Atlanta and we saw Kenny Atkinson give Russell priority over Dinwiddie when both guys were healthy to close out the season, so perhaps a big year is in the offing.